At least you found the issue... mine ended up blowing a head, and she is no more. I see... that one may have me stumped as well. But definitely have your car checked for exhaust damage... had it not been for me following my gut instinct, I probably still would be trying to figure out why my car sounded and drove rough. My only issue now: finding a ride to go exchange the brand new battery that died. Needing some advice with Old Six. Wanting to know how to wire the fogs with the parking lights, I find it annoying that the fogs only come on with the headlights... thanks in advance. I'll go ahead and introduce myself, I'm Ty'Eira Marie Morrison. This is my recently acquired Hunter Green Mica Metallic '95 ES-V6 automatic, affectionately named "Old Six". I've had the pleasure of owning this wonderful Mazda for a good seven weeks now, she's starting to show me that I can have faith in a $600 beater with a heater. I had my doubts about jumping into an automatic 626 at first (seeing as how the reputation of them has resulted in the death of most of these cars), but I ABSOLUTELY had to have a GE platform 626 because of the resemblence of the larger '90-'94 929. So far, in my seven weeks of ownership, I've managed to: 1) Replace the broken factory cassette player and dealer-installed in-dash CD changer controller (trunk changer was missing, I believe she told me it was 10-disc) with a working cassette unit from a '96 LX and working in-dash CD player from a '94 ES-V6; 2) Clean up headlights, fog lights, interior, wheels, and paint with a Nu Finish wax job; 3) replace the busted grille and add a factory lip spoiler from a '96 LX, find a replacement passenger sunvisor, order new headliner material, order a 3-button '90s Ford key fob and Mazda Eternal Flame fob case and program it to the factory alarm system, despite the "PANIC" feature being inoperable. Next steps: Tinted windows, Gold emblem package, new hood, fresh paint w/pinstripe removal, "ES" fender decals, '95+ Shogun PGT blades (aluminum or '97 GTS chrome doesn't matter at this point, since I can find either matching centre caps), new Driftwood seats, wood dash panelling, spare manual transmission/parts, hi-rise spoiler w/CHMSL, and hopefully a spare motor just in case (it makes me so sad about not ever being able to get a Euro lip kit, I really like that kit). So far, all she seems to need is valve cover gaskets, a new exhaust system and front suspension work. But I'm growing to love this Mazda more and more every day, I can't wait to move and add a matching Hunter Green Mica Metallic MX-6 LS and a BG Protégé to my fleet (yes, this car has released my inner Mazda enthusiasm). This car has been sort of a lifelong bucket list car, and #2 on my list of dream cars because of how underrated it is and how much potential this car has. 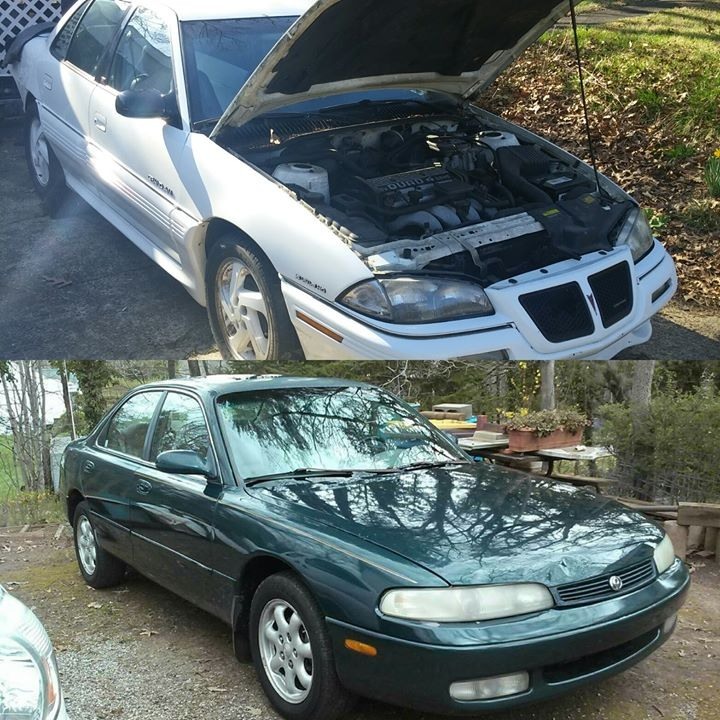 I've shown a little bit of the transformation I was able to make, since I'm on the parts hunt for two different cars (also have a '93 Pontiac Grand Am GT Quad 4 High Output Sedan I'm working on restoring). So far, the lip spoiler works with the stock look and wheels, but I want to see what she looks like when done. I'm anxiously awaiting the moment this $600 beaten heap is transformed into a $2000 work of vivid art... and I'm proud thus far to be a part of the 626 community.